Writing as Daughters, Healing as Writers – Find You in the Sun – A daughter's slow waltz with her mother's dementia. Pauletta Hansel and I sat as facilitators, at the front of the conference room in the Cincinnati’s offices of the Alzheimer’s Association, facing participants for a workshop titled, Writing Our Lives as Caregivers. Both of us were grown daughters of mothers experiencing dementia. But Pauletta and I had first known each other from a different life. One grounded in writing. I was new to writing then. And new to an organization called Women Writing for (a) Change. I was also new to grief. And single motherhood. And the arts, as my previous training had originated from a technical background and multiple cancer floors. But I needed something to sink my teeth (or pen into) and found how much I not only relished the writing process, but speaking and sharing with others about writing brought about healing for myself. It was by some surprise then, that I found myself nominated for the board at WWfaC, with Pauletta at the helm. I was even more surprised that she nominated me as an “energetic volunteer of the arts”, profiled in the newspaper. I felt rewarded, not necessarily for something I did, but for something I felt. Years later, she and I were grounded by our mothers. But we were still writers. In fact, Pauletta as the Poet Laureate of Cincinnati. And I, a blogger on the topic of dementia, with a few smaller publishing feats under my belt. In recent years, our individual work had evolved. The work was from us, but not always about us. However, as we began plotting out our circle, Pauletta had suggested we use our own writing as prompts to move participants towards their inside words. I was surprised. I had never used any of my work as a model for others to emulate. But I knew, as a writer, we must know when to show the way. What was the best way to demonstrate writing about loved ones with dementia, instead of telling them? Yes, showing them. Thus two of our poems acted as the impetus for many, many words in that workshop. Ironically, my best writing that summer day originated from one of Pauletta’s poems. 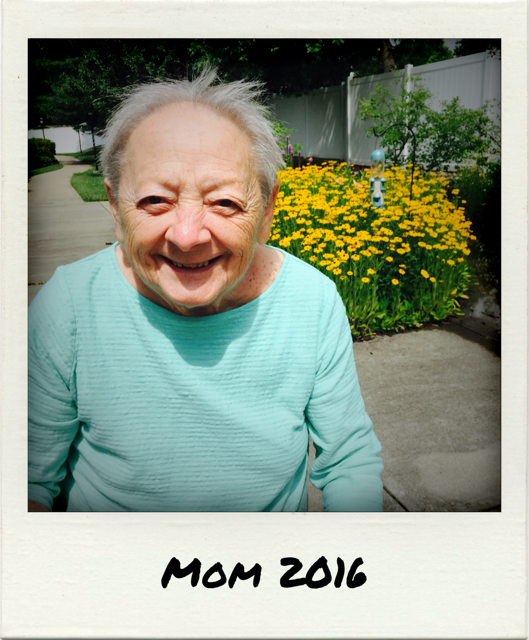 In the best of Mom’s moments now, she smiles. A broad, I know you because I have loved you, smile. It is that smile I always carry with me, for those “other” days, of which there are plenty. While she demanded my father carry the camera, change the film, and snap the picture, she never wanted to be the subject of his frame. She would duck away from the lens or out of sight. If she became the subject, her smile often appeared forced, painted on like lipstick. Those were my memories of her in black and white, and Polaroids. Ironic now, a shift in media has brought more vivid colors, more clarity as I capture her. In tandem, she smiles more. She has let go of a certain consciousness about her appearance – her hair, her nails, her style of dress. Mom’s smile now comes from a place deep within. When she first sees me, she lights up, even if in the next moment, she begins to yell again. I experience my mother as joyful (not happy, that emotion seems fleeting). Her pudginess gives way to the youthfulness of a four- or five-year-old. This is how and when I remember to love. As we closed the writing circle that day, more tears had been put to paper and more joy had replaced the tears. The workshop also brought a demand for more workshops like it. In the interim, each participant was asked to contribute two lines to a group poem. Gifted with an ability to see patterns in others’ words, Pauletta crafted this touching group poem. I have high hopes the Alzheimer’s Association, and other organizations, will continue to sponsor similar programs that use writing as a tool to mend. As a society, we don’t need more pills, just a few more pens and poets who can lead the way through the heart, even if the mind has already let go. I can’t speak for Pauletta, but in that workshop, we sent the participants off on their day not as spouses, or siblings, or adult children. Not even as caregivers. We sent them off as writers, in hopes they could mine with their words what the mind could not grasp. Send an email to Annette Januzzi Wick for more information on writing workshops for caregivers, individuals experiencing dementia and other related topics. Information on her upcoming workshop held in September – From Moments to Memories can be found at Women Writing for a Change. Visit Pauletta Hansel for more information on Cincinnati’s 2016 Poet Laureate. Annette, what a beautiful piece…thank you. I’ve heard so much positive feedback about that class.